The rapid fire Texas Longhorn consignment sale season is slithering to an abrupt ending as Summer is over and Winter is coming. Events were exploding to the tune of 18 contests during one Saturday in October. A serious breed aficionado would have to become a dozen people to keep up with the "event race" for Summer and Autumn. As these often highly promoted events struggle desperately for participation and funding, spending thousands on emails and ads, the producers who sell privately fade into the dust behind the serpentine herd. There is so much hype about registered cattle sales, yet less than 5% of Texas Longhorns sell in these sales. The rest sell privately, are processed for meat or disposed of in local wholesale cattle auctions. 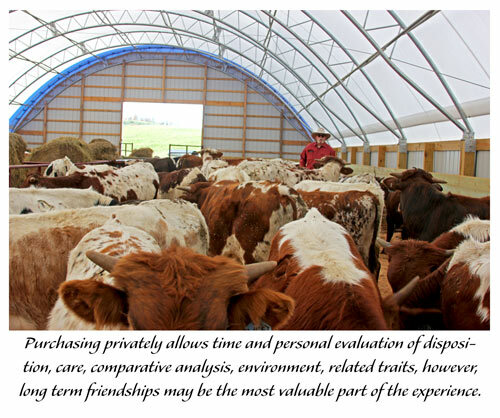 The fact most cattle sale privately, it behooves everyone to know how it works and be prepared at this time of year to profit from private buying and selling. Now, during the coming Winter, it is "open season." It is every producers "private treaty sale season." Now small and large can re-group, get their act together and do those private sales without the constant bombarding of continuous multiple sales vying for every weekend hour. Private purchases allow buyers and sellers to establish friendships. It is personal to buy from friends, from people you are comfortable with their guarantees and their marketing data. An auction may only allow less than two minutes to make a large financial decision. Advantages of really knowing what you are buying only come with private treaty allowing enough time to carefully evaluate the offering. You can buy when there is time to ask the seller detailed questions about selected animals. You are not rushed to make an important buying decision in a matter of seconds. 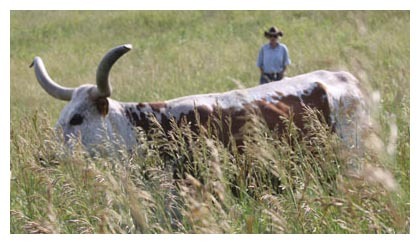 You can choose convenient timing to buy at the ranch, to view cattle, to haul cattle, and make a plan that is flexible. You have the freedom to compare in-herd cattle to the ones offered for sale. Auctions demand immediate cash; privately, payment terms may be negotiated. Seldom are herd sires, young or old placed on the auction block for many reasons. Most good bulls are bought privately with a considerable amount of thought, and the price is unpublished. Economy of sales. Sellers don't have to charge for consignment fees, hauling, commissions or health tests that may not even be required for the buyer's state. This can be hundreds of dollars of savings for the buyer and no loss to the seller. This ever increasing cost can make or break some deals. Knowledge of sales. Make an appointment with the seller to study the breeding program, or lack of it. Buy cows with calves at side. Know what kind of calf a cow raises. See her last year's calf and compare. Personally inspect the bull who sired the calf at side. Personally inspect the bull who bred the cow offered for sale. Personally see the dam of a cow offered for sale. Take a trailer and eliminate hauling fees. Learn about the seller's data collection. Do they measure and weigh all cattle? What breeding records do they keep. Auction purchases go to the highest bidder. Perhaps a volume purchase of several selections would qualify for a reduced price by private treaty. For some reason cattle selected to sell at auction were chosen because the producer was pleased to not own them any longer. See what the producer chose to "not sell" and ask them why? Evaluate the producers facilities, sanitary conditions, corral safety, and handling systems. Buy breeding stock locally, which saves hauling fees, costly health testing, stress from cattle adapting to new climates. View prospective cattle purchases in the pasture rather than from a sky box. While buying at the ranch identify the direction a wise producer is moving the herd. If a producer sells a lot of cattle they will find out which way to go to raise profitable genetics. Learn from their experience. Private purchases can start long term friendships. When a new producer has a problem they won't feel guilty asking for advice. They have already established a camaraderie that may be better and worth more than the local vet. Have you ever heard of a new buyer calling the auctioneer for a cattle health or management problem? Back at the ranch, it is a good time of the year to cull the herd. December is a good time to preg check and take a long cold look at grinding poor producing cows, or the herd sire that keeps visiting the neighbor. Grind cattle that are not good enough to spend high consignment fees to put them in an auction. Most producers spend more money maintaining cows from Dec 1 to March 1 than the whole rest of the year. Make serious decisions December 1 that will save a lot of winter hay costs. Sell cattle for less money in the Autumn than in the Spring -- that makes sense. Head'em up moov'em out unless they have earned a winter home. Every producer should work to develop a private treaty market group of clients. 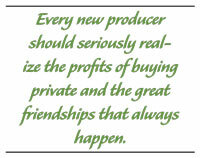 Every new producer should seriously realize the savings of buying private and the great friendships that happen. Now is the private sale season...... go for it.